If you’re planning to go on one of the brilliant escorted tours to Israel and you’re interested in history, culture, and amazing sights, then the country’s third largest city is the place for you. Haifa is located on the gorgeous slopes of Mount Carmel facing the Mediterranean Sea, offering the most wonderful views imaginable. It’s also a popular multicultural city where harmony and a blend of Arab and Jewish cultures are treasured. 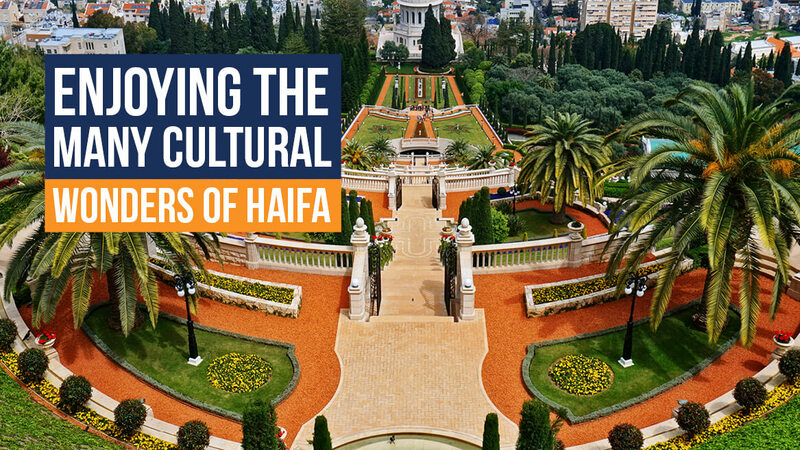 Haifa is full of cultural pearls for you to discover, but here are some must-sees for you to start the exploration. There’s a myriad of museums in Haifa. For some wonderful contemporary Israeli and international art, visit one of the three largest art museums in Israel, the Haifa Art Museum, opened in 1951. Follow that with the Madatech Science and Technology Museum – the national museum of science, filled with hundreds of interactive displays and many impressive exhibits. The Clandestine Immigration and Navy Museum tells the story of Israel’s Navy, while the Haifa City Museum tells the story of the city itself. The Atlit Detainee Camp is the place where European Jews trying to reach the Holy Land during and after the Holocaust were brought to by the British forces who controlled the area. There isn’t much left from the camp, but it is an important historical site to visit nonetheless. Also known as the Hanging Gardens of Haifa, this World Heritage Site consists of nineteen terraces around the Shrine of the Báb on Mount Carmel, and it’s one of the most popular destinations in Israel. While the construction began in 1987, the public was not allowed in until 2001. The Baha’i Gardens cover cca 200,000m2, extending almost a kilometer up the mountainside, and they are linked by stairs, majestically combined with streams of running water flowing down Mount Carmel. You will notice the many wonderful inspirations for this cultural wonder, such as Persian gardens, Kashmir gardens, and English gardens. Established in 1868 by the German Templers at the foot of the Baha’i Gardens and adjacent to the beautiful sea, in what is today one of Haifa’s most popular neighborhoods, this German Colony was the first of several such colonies established during the second wave of settlements. Many of the original homes still exist and have been restored, and today they stand next to the city’s contemporary sites, including galleries, cafés, restaurants, boutiques, and hotels. While at the German Colony, visit ‘the Wadi’ nearby, and experience an authentic Arab district with narrow alleys and stone houses, in the heart of which rests the market. You can browse numerous Arab and Jewish goods, all the while enjoying the amazing smell of the delicious falafel made all around you. Get yourself and your loved ones some wonderful souvenirs, then sink your teeth into the juicy fruits and veggies, and try the fresh, local baked goods or seafood, and numerous other delicacies. Another site located at the foot of Mount Carmel that you must visit is the wonderfully ornamented chapel with a domed roof, which includes the cave of an immense religious significance for Jews, Christians, Muslims, and Druze. It’s believed that this is the cave in which the prophet Elijah lived, prayed, and taught in the 9th century BCE. Another cave associated with Elijah is located under the altar of the Stella Maris Monastery’s main church. The Stella Maris Monastery (Star of the Sea), or the Monastery of Our Lady of Mount Carmel for monks is a Discalced Carmelite monastery overlooking Haifa and the sea, built in 1836. Another monastery of the same name, located higher up on Mount Carmel, is reserved for nuns. The shape of the monastery’s main church resembles a cross. Its dome is adorned with vibrant paintings based on motifs from the Old and New Testaments, and with biblical verses in Latin. The Monastery is home to a stunning statue of Mary and Jesus, placed behind the altar, and under the altar, you’ll find the cave where the prophet Elijah is said to have lived. The Monastery is open every day, it’s free to enter, and it can be reached by the cable car from Bat Galim Promenade. If you happen to be in Haifa when the Israel Philharmonic or other musical and dramatic groups perform, make sure not to miss such a fantastic experience. Haifa’s biggest annual cultural event is the International Film Festival, which lasts for a week at the end of September, turning Haifa into a city of great festivity. Every December, you can be a part of the Holiday of Holidays – a festival that celebrates the Jewish, Christian, and Muslim holidays, with a lively and jubilant street celebration that includes fairs, concerts, art, theatre, shows for kids, conferences, and mouth-watering Mediterranean food and drinks.